One of my favorite things about Fort Worth is the Water Gardens in downtown. The gardens were built in the 1970s and designed by two architects, Philip Johnson and John Burgee. The complex includes the active pool, the most iconic of the features, which has steps from ground level down into the funnel waterfall. The steps are wide, but I definitely had some moments of feeling like I might fall in. The water is so loud that you can’t hear the bustle of the city traffic. It’s neat to feel so close but so far away from people. In contrast, the meditation pool is a cool and quiet area lined with trees. The aerating pool sprays water from fountains in a grid pattern. Apparently, the designers wanted it to look like a checkerboard if you see it from above, but even from ground level it’s beautiful. The garden also includes some green space and plenty of trees and winding paths. 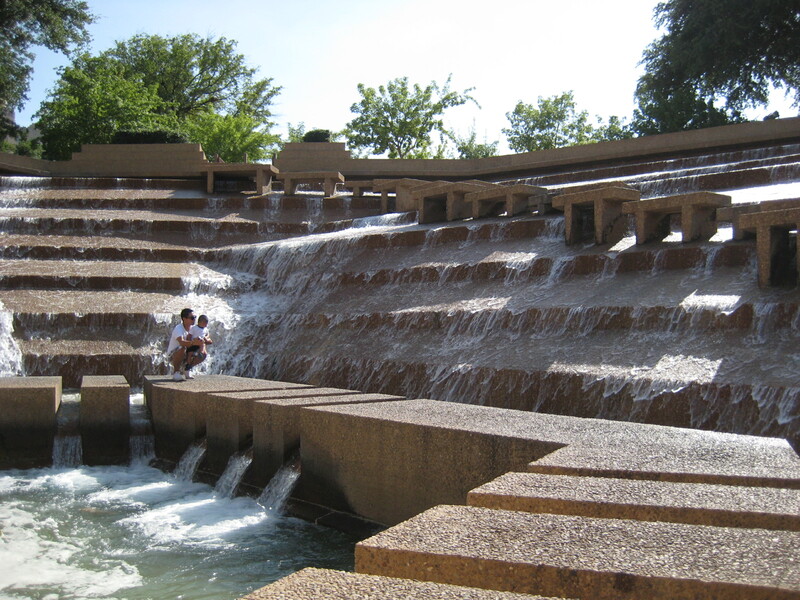 In the middle of concrete-heavy downtown Fort Worth, the Water Gardens is a special place where you can simply marvel at the unique architecture and wonder at the silence compared to the bustle of the downtown area. It isn’t a place to go spend a day—it’s really a half hour to an hour stop—but the next time you’re looking for something to do before grabbing dinner in Sundance Square, it’s definitely worth the drive (or long walk) to the Water Gardens. ← Lazy Girl Cooks: The Best Sautéed Carrots You Will Ever Eat. Seriously.